Owatonna was first settled in 1853 around the Straight River. The community was named after the Straight River, which in the Dakota language is Wakpá Owóthaŋna. A popular, but apocryphal, story is that the town is named after "Princess Owatonna," the daughter of a local Indian chief who was supposedly healed by the magic waters of a nearby spring. 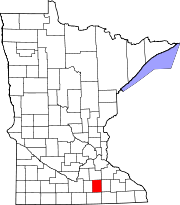 The earliest the Owatonna area was settled was in 1854 and platted in September 1855, but it was incorporated as a town August 9, 1858, then as a city on February 23, 1865. In 1856, Josef Karel Kaplan emigrated from the village of Dlouhá Třebová, southeast of Prague, Bohemia (now the Czech Republic), and selected a quarter section [160 acres (65 ha)] of land near the town of Owatonna. Kaplan described Owatonna as having just 50 small homes, but predicted 100 within a year, along with a railroad. With just four stores and a pharmacy, Owatonna quickly prospered and grew to 1,500 inhabitants in just 5 years. Kaplan wrote about the Owatonna area in letters donated to the Minnesota Historical Society. In them, he described often seeing Indians – people with "tough constitutions...brown skin and good dispositions," explaining: "When you read about battles between whites and Indians, it is the whites who are to blame." In 1866, Kaplan helped organize the Catholic cemetery, and, a year later, the Bohemian National Cemetery of Owatonna. Kaplan's Woods is part of the land originally owned by Josef Kaplan, and later Victor and Anna Kaplan. The State of Minnesota created Kaplan's Wood State Park, which was later transferred to the City of Owatonna. The Kaplan's Woods Parkway contains over 6 miles (10 km) of hiking and cross country skiing trails, and nearly 2 miles (3 km) of hard—surfaced, handicapped—accessible trail. The parkway includes Lake Kohlmier, a 35-acre (14 ha) lake. Maps of the parkway are available at the Park and Recreation office. The Minnesota State Public School for Dependent and Neglected Children was built in 1886. The school took in orphans from around the state and taught them "the value of drill, discipline, and labor." The children who died in the institution were interred in the Children's Cemetery behind the school. In 1945, the orphanage closed and in 1947 the State Public School was officially abolished and all its lands, buildings, property, and funds were transferred to the newly established the Owatonna State School, which provided academic and vocational training for the developmentally disabled. The Owatonna State School was closed June 30, 1970. In 1974, the City purchased the compound for its office space. Renamed "West Hills," it continues to serve as the City's administration complex and home to many nonprofit civic organizations including a senior activity center, the Owatonna Arts Center, two nonprofit daycare centers, a chemical dependency halfway house, and Big Brothers/Big Sisters, among others. In 1995, the film Angus (1995), whose cast included George C. Scott, Ariana Richards and James Van Der Beek, was filmed on location in Owatonna, mostly at Owatonna Senior High School. In July 2008, a Raytheon Hawker 800 corporate jet crashed near Owatonna, resulting in eight deaths. On October 31, 2010, Owl City's Adam Young held a hometown concert in the Owatonna Senior High School gym. On November 3, 2015, the Owatonna Public School District passed a bond referendum to fund school facilities improvements focusing on deferred maintenance, safety, and Elementary school crowding. As a result, the school district received $77.9 million to repair all buildings, replace out-of-date equipment, update security in all seven public school buildings, switch the use for two school buildings, and reconfigure grades from K-5, 6, 7-8, 9-12 to K-5, 6-8, 9-12. All facility changes and projects were completed by September 2018. The Steele County Historical Society “preserves Steele County's past, shares the county's stories, and connects people with history in meaningful ways, for today and for tomorrow.” Established in 1949 to preserve the history of Steele County, it has grown to become one of the largest and most prestigious historical societies in the state. In 1962, the Society permanently leased a portion of the southeast section of the fairgrounds to begin a pioneer village, the Village of Yesteryear, which has grown in the years since through the additional move of historic structures, as well as museum buildings built on site. Owatonna is an economic center of Southern Minnesota, with diverse industries. Federated Insurance is the largest employer with 1,521 employees, followed by an expanding Viracon, which has 1,434 employees. Both have their corporate headquarters in Owatonna. Other large employers in the community are Bosch, Newell Brands (Jostens), Gopher Sport, Brunswick Corporation (Cybex International), McQuay International (Daikin Industries), Owatonna Public Utilities, AmesburyTruth, ISD 761, Wenger Corporation, Owatonna Clinic - Mayo Health System, and Owatonna Hospital - Allina Hospitals & Clinics. The city is located in Minnesota's 24th District, represented by John Jasinski, Republican. District 24 includes portions of Steele, Rice and Waseca and Dodge counties in the southeastern part of the state. Owatonna also lies in House District 24A, represented by State Representative John Petersburg, a Republican. He was first elected to that office in 2012, and was reelected to a second term in 2014. Owatonna is located in Minnesota's 1st congressional district, represented by Jim Hagedorn, a Republican. In Owatonna was the Owatonna Art Education Project. In the middle of Owatonna's downtown is the National Farmer's Bank, widely recognized as one of the premier examples of the Prairie School of architecture in America. Designed by Louis Sullivan, the building was finished in 1908 and features gold leaf arches, stained-glass windows, and nouveau baroque art designs, all still in pristine condition. It is a national landmark on the National Register of Historic Places and currently functions as a branch of Wells Fargo Bank. Land originally owned by Josef Kaplan, was given to his son, Victor who then built a home for his bride, Anna Kaplan near what is now Cedar Avenue. The woods were an important part of the Kaplan's life and well known in the area. The State of Minnesota created Kaplan's Wood State Park, which was later transferred to the City of Owatonna. Now the Kaplan's Woods Parkway contains over 6 miles of hiking and cross country skiing trails, and nearly two miles of hard—surfaced, handicapped—accessible trail. There are claims that the woods are haunted. The parkway includes Lake Kohlmier, a 35-acre lake. Maps of the parkway are available at the Park and Recreation office. The State School Museum is located at West Hills on the grounds of the former Minnesota State School for Dependent and Neglected Children. The Steele County Blades is a junior hockey team who play at Four Seasons Center and are a member of the MN Junior Hockey League. Although having a similar name and logo, this team is unrelated to the former Southern Minnesota Express, that relocated to Michigan to become the Motor City Machine. The team is named the Owatonna Express instead of the Southern Minnesota Express because, "With the new team in Albert Lea joining the North American Hockey League this season, and others in the Twin Cities and Rochester possibly coming into the fray in the next few years, the Express are no longer the sole owners of southern Minnesota." The Express begin play in the 2008-2009 season. The Owatonna Express completed their final season in early March 2011. Riversprings is a public water park that opened the summer of 2009. It has many features and amenities including: a tube slide, a body slide, a lazy river, an activity pool, a zero depth entry pool, a climbing wall, a lily pad walk, a sand volleyball court, a concessions stand, and locker rooms. Riversprings has many programs, some of which are: lap swim/water walking, tiny tot time, water aerobics, and swimming lessons. The main operator of the pool, Eric Anderson, keeps the public updated with hours and weather announcements along with specials through the Riversprings Facebook page and through the City of Owatonna page. According to the United States Census Bureau, the city has a total area of 14.62 square miles (37.87 km2); 14.53 square miles (37.63 km2) is land and 0.09 square miles (0.23 km2) is water. The oldest part of the city (including the downtown area) is located on a low-lying area on the eastern bank of the Straight River, extending towards the south from Maple Creek. The city has grown in all directions, and now lies on both sides of the river, as well as above the ridge north of Maple Creek. Significant growth in recent years has occurred to the northeast, where homes have been built along the ravine of Maple Creek as well as alongside Brooktree Golf Course, to the north, and to the southeast. Geographical landmarks of note include Kaplan's Woods, a hardwood nature preserve on the southern border of the city, Cinder Hill, a steep 60 foot hill on Linn Avenue overlooking downtown that is used by local athletes for training, the Straight River dam, originally used to power a mill and now reconstructed to include a fish ladder, and the Forest Hill Cemetery, an old wooded cemetery on the ridge to the north of Maple Creek that marks the boundary between the oldest parts of the city and more recent developments. Record rainfall events from Wednesday, September 22, 2010 to Friday, September 24, 2010 caused record flooding of the Straight River and Maple Creek in and near Owatonna, with developments in the floodplains of both streams being completely inundated. As of the census of 2010, there were 25,599 people, 10,068 households, and 6,737 families residing in the city. The population density was 1,761.8 inhabitants per square mile (680.2/km2). There were 10,724 housing units at an average density of 738.1 per square mile (285.0/km2). The racial makeup of the city was 91.2% White, 3.8% African American, 0.3% Native American, 0.9% Asian, 2.2% from other races, and 1.5% from two or more races. Hispanic or Latino of any race were 7.3% of the population. There were 10,068 households of which 34.1% had children under the age of 18 living with them, 52.9% were married couples living together, 10.0% had a female householder with no husband present, 4.0% had a male householder with no wife present, and 33.1% were non-families. 27.9% of all households were made up of individuals and 11.4% had someone living alone who was 65 years of age or older. The average household size was 2.49 and the average family size was 3.05. The median age in the city was 37.2 years. 26.9% of residents were under the age of 18; 7.3% were between the ages of 18 and 24; 26.3% were from 25 to 44; 25.5% were from 45 to 64; and 13.8% were 65 years of age or older. The gender makeup of the city was 48.8% male and 51.2% female. As of the census of 2000, there were 22,434 people, 8,704 households, and 5,936 families residing in the city. The population density was 1,779.9 people per square mile (687.4/km²). There were 8,940 housing units at an average density of 709.3 per square mile (273.9/km²). The racial makeup of the city was 94.09% White, 1.56% African American, 0.13% Native American, 0.99% Asian, 0.03% Pacific Islander, 1.92% from other races, and 1.27% from two or more races. Hispanic or Latino of any race were 4.31% of the population. There were 8,704 households out of which 35.4% had children under the age of 18 living with them, 56.5% were married couples living together, 8.4% had a female householder with no husband present, and 31.8% were non-families. 26.6% of all households were made up of individuals and 10.5% had someone living alone who was 65 years of age or older. The average household size was 2.52 and the average family size was 3.08. In the city, the population was spread out with 28.1% under the age of 18, 8.4% from 18 to 24, 29.8% from 25 to 44, 20.8% from 45 to 64, and 12.9% who were 65 years of age or older. The median age was 35 years. For every 100 females, there were 95.0 males. For every 100 females age 18 and over, there were 90.5 males. The median income for a household in the city was $45,660, and the median income for a family was $54,883. Males had a median income of $37,691 versus $25,511 for females. The per capita income for the city was $20,513. About 4.3% of families and 6.6% of the population were below the poverty line, including 7.9% of those under age 18 and 6.9% of those age 65 or over. Parts of the 1995 movie Angus were filmed in and around Owatonna, including Owatonna Senior High School, its football team, and marching band. In 1974, the City of Owatonna purchased the campus of the former Minnesota State Public School for Dependent and Neglected Children, which had been in operation from 1886 until 1945. The site was renamed West Hills, and now serves as an administrative center for the City of Owatonna, as well as housing several non-profit organizations in the various historic buildings, including the Owatonna Arts Center. Much of the 2014 silent film The Root of Evil was shot on location in Owatonna, most notably at the Owatonna Senior High School and the Gainey Center. Produced by a cast and crew of over 60 Owatonna High School students, the film has received 10 awards at over eight film festivals on the international circuit. Memorabilia from the film is set to be on display in the high school museum. Mike Hegstrand, professional wrestler, Hawk, half of the Road Warriors, 1958-2003; born in Owatonna, resided on Xerxes Ave.
^ United States Census Bureau. "Census of Population and Housing". Retrieved July 24, 2014. Wikimedia Commons has media related to Owatonna, Minnesota. This page was last edited on 7 April 2019, at 02:18 (UTC).